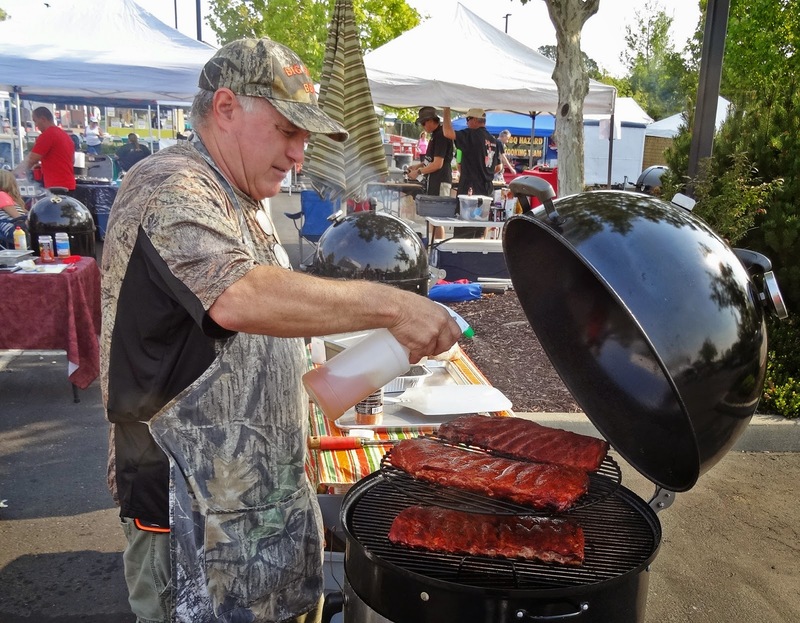 Through out the competitive barbeque season we meet a lot of people who create and sell barbeques sauces and rubs. Ms. Goofy has become good friends with Christine a certified barbeque judge. 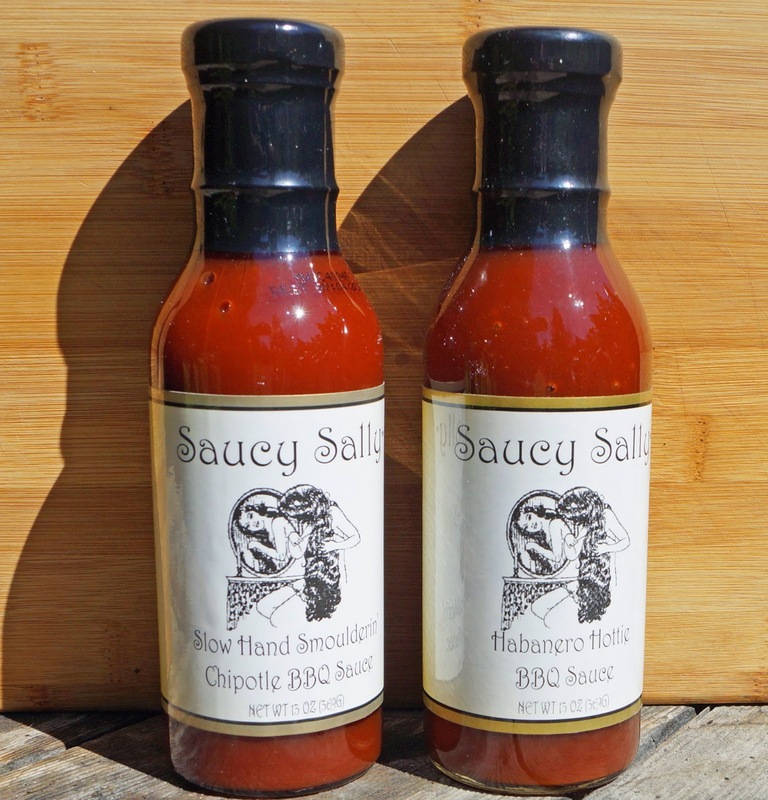 When Christine is not judging bbq she just so happens to sell Saucy Sally barbeque sauce manufactured by Spice Island of Auburn, California. Christine generously gifted us several bottles of her product. It did not take us long to break open the “Slow Hand Smoulderin Chipotle BBQ Sauce. 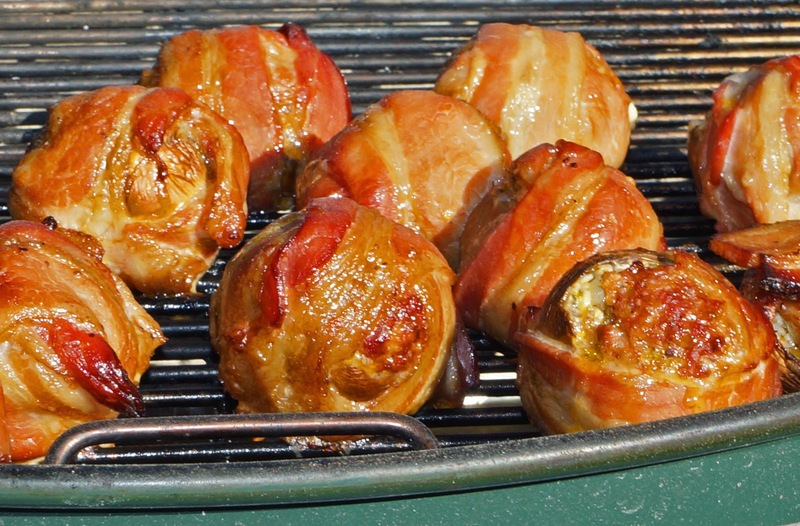 This will be the perfect excuse to fire up the grill and smoker for beef ribs and bacon wrapped stuffed mushrooms. I chuckle and guffaw with that last sentence because; we need an excuse? 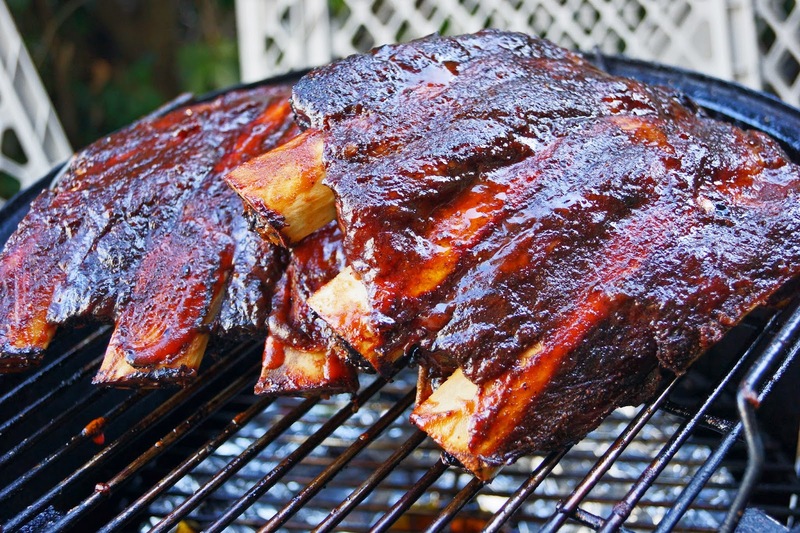 Pull up an easy recliner and turn on some Monday night football because we are smokin. I will spare you the ingredient list today and just say it is long. The aroma is of sweet smoky tomato’s with a faint hint of vinegar in the background. The sauce is dark red, thick, seed free and pours freely from the bottle. There is a slight heat from the chipotle peppers. It is a mild fire that will not require a fire hose to put out. This sauce is sweet but is balanced with the rest of the ingredients. We added sauce on both of our ribs and stuffed mushrooms at the end of the cook and only for a brief moment on the fire to set the sauce. This sauce was just what the doctored ordered Saucy Sally sauce complimented and enhanced our beef ribs and bacon stuffed mushrooms with its sweet smoky tomato and pepper flavors. 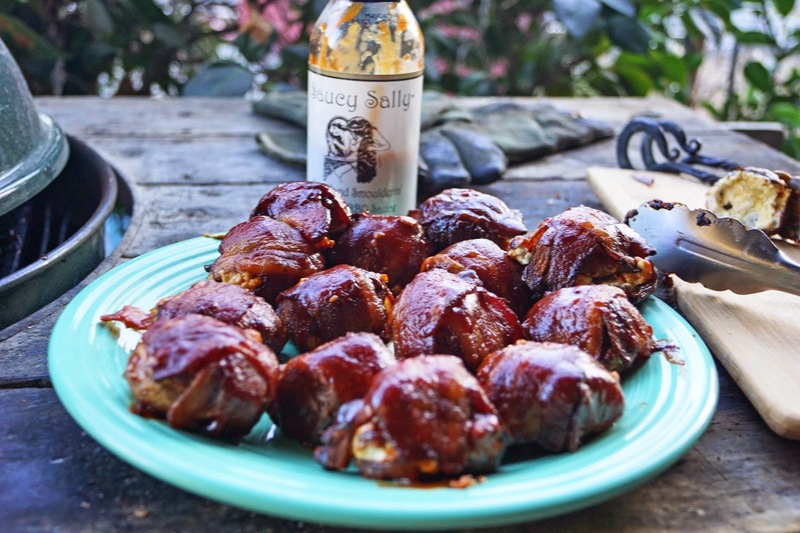 We would happily use Saucy Sally on any barbeque application. Thanks Christine, this sauce is a winner. 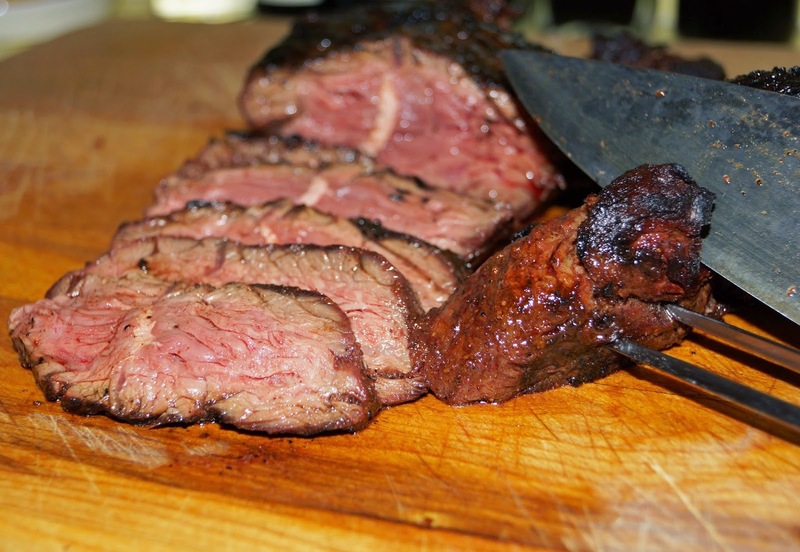 The Hanger steak is sometimes referred to as the 'Butchers Steak' because the butcher would save this flavorful cut for himself. The recently released or paroled 'greatwhite hunter' and yours truly went on a mini 'Meat Adventure' Our journey brought us to Angelo's Meats and then Willowside Meats. Willowside Meats has a fantastic offering of aged corn-fed beef for sale. They also have grass fed beef for hipster's. The 'greatwhite hunter' was the first through the door at Willowside and proceeded to order the whole t-bone and rib-eye racks. He cleaned out the meat case. Luckily there were some Hanger steaks left. I have to admit that I am not familiar with this particular cut. Ms. Goofy has ordered it in the restaurant but we have never cooked this cut at home. The butcher told us it was great for bbq. It was similar to a flank steak in its handling and cooking. There is a membrane that runs down the center of this cut. 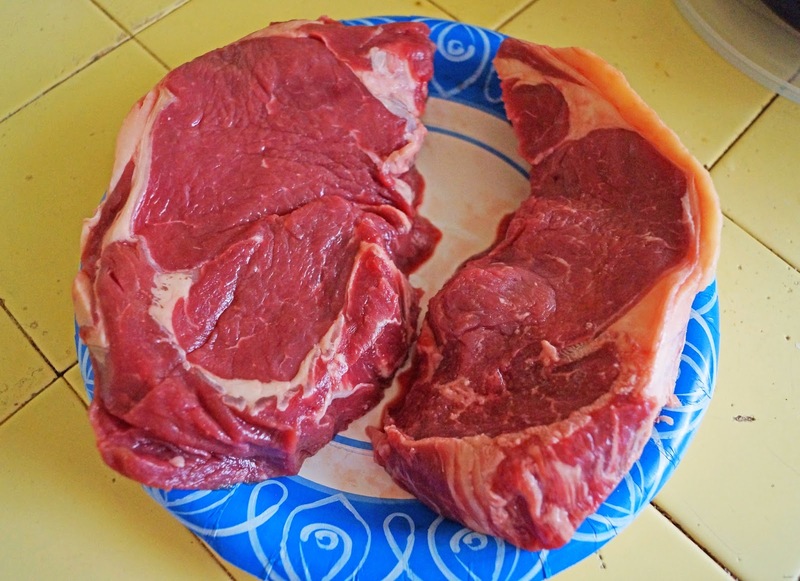 The steak weighed around a pound and on half. Let's give it a try. The preparation will be a simple rub and bringing it to room temperature. 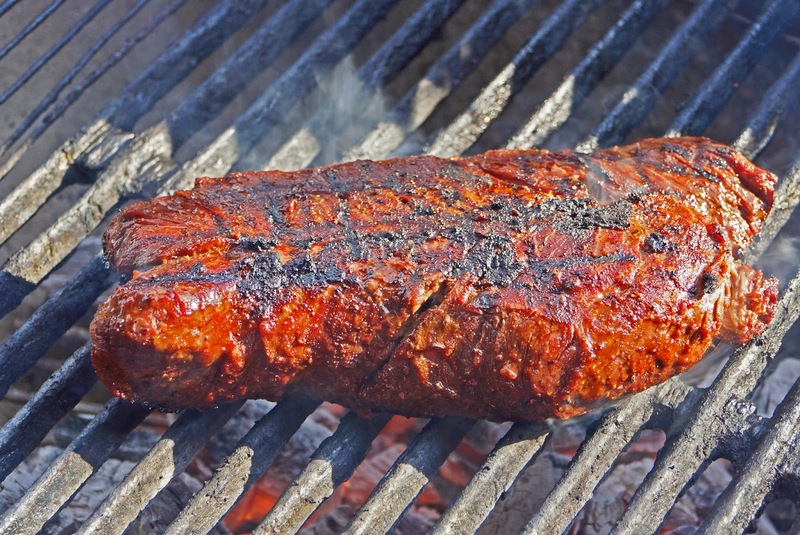 A smoking hot mesquite charcoal fire would blast heat to cook our steak. Our goal was to cook to a medium rare on the rare side. Approximately 5 minutes to each side turning for grill marks was all she wrote. (120-125 degrees). The all important rest for 10 long minutes is necessary. We sliced the roast against the grain into thin slices. It was like slicing through butter. This was the definition of tender. We have arrived in flavor town. I actually detected a hint of sweetness to this beef. I also want to throw out the term umami. 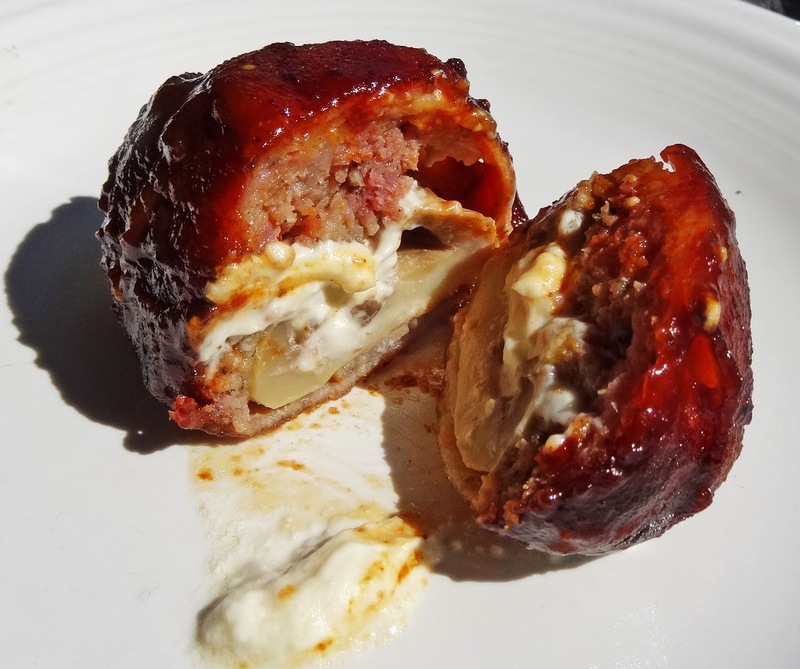 You would take a bite and a savory sensation would swirl through out your senses producing a craving for another taste. WOW!. No wonder the butcher would save this cut for himself. Thanks to the 'greatwhite hunter for cleaning out the meat case so we could experience the Hanger steak. 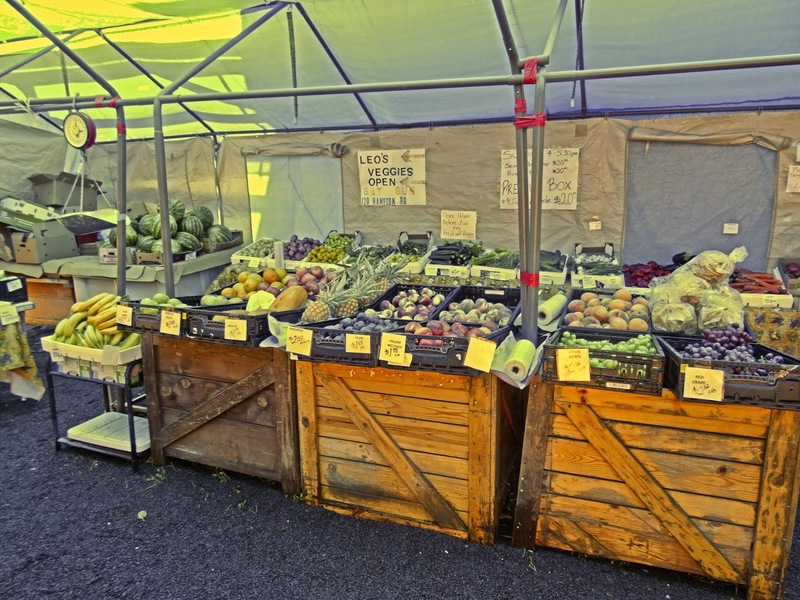 Johnson Farm is the location of Leonardo's Produce, our new favorite Sunday produce excursion. They own the land which Leonardo organically tends and runs his market. 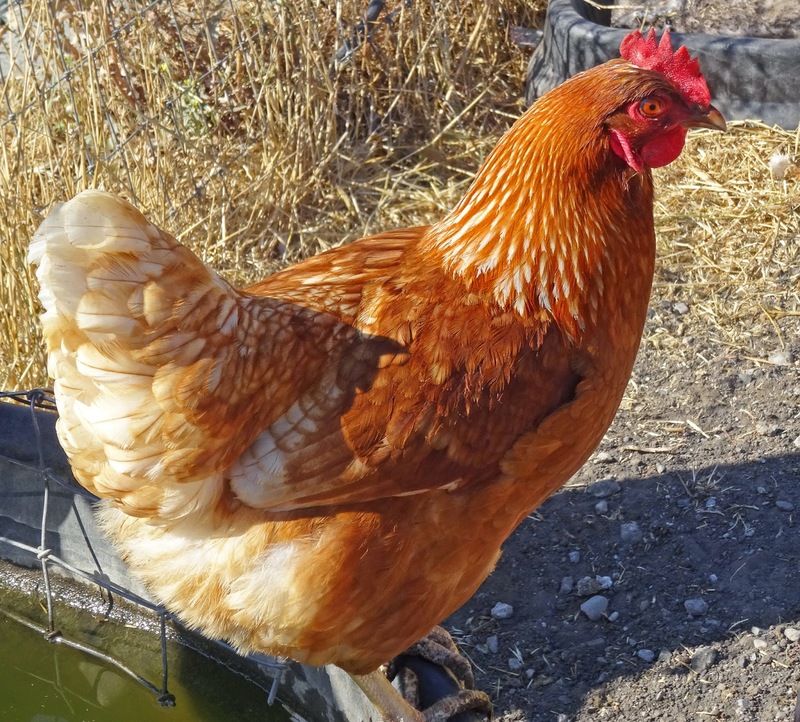 Johnson Farm has a small line-up of quality products that is raised and produced on their property. Johnson Farms has local honey, farm fresh eggs, Berkshire pork and next month, Black Angus beef. Today we want to share our purchase of Berkshire pork rib chops and a small roast.The grill and smoker will transform this heritage pork to some tasty meals. 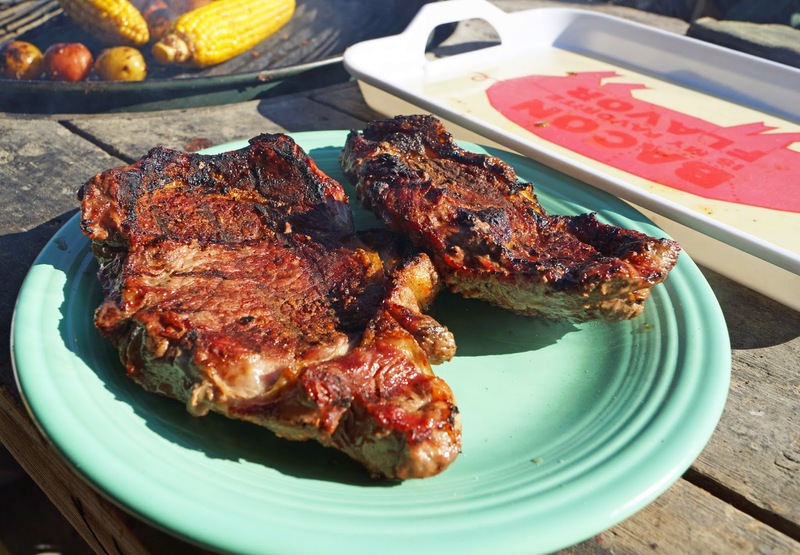 We grilled some rib chops. A light dusting of "The rub of the day" would be our only seasoning. 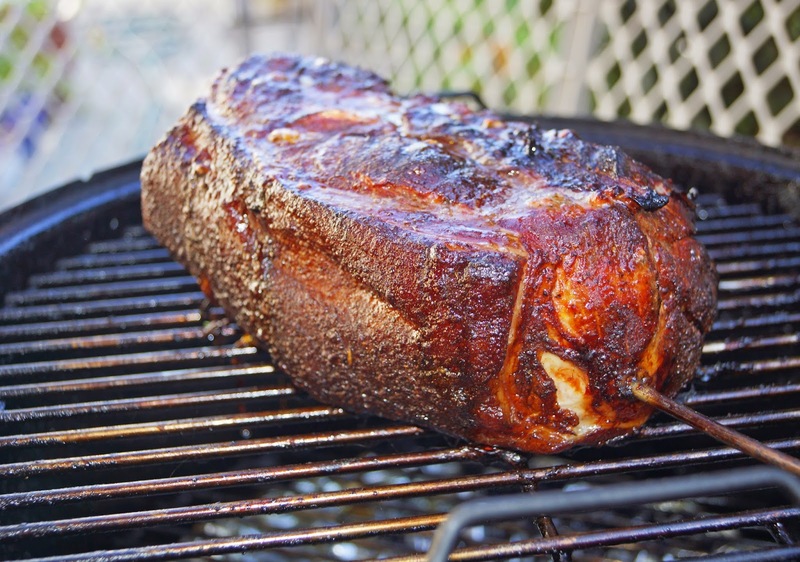 Berkshire pork has an old time pork flavor that tastes phenomenal. Next a roast was smoked on our Weber Smokey Mountain Cooker for 4 hours. When we purchased this frozen roast the cut was a mystery. It was part of the shoulder right near the joint. It turned out very flavorful cut but did not have a lot of meat because of the knuckle bone. This still was a flavor treat that was enjoyed by all. 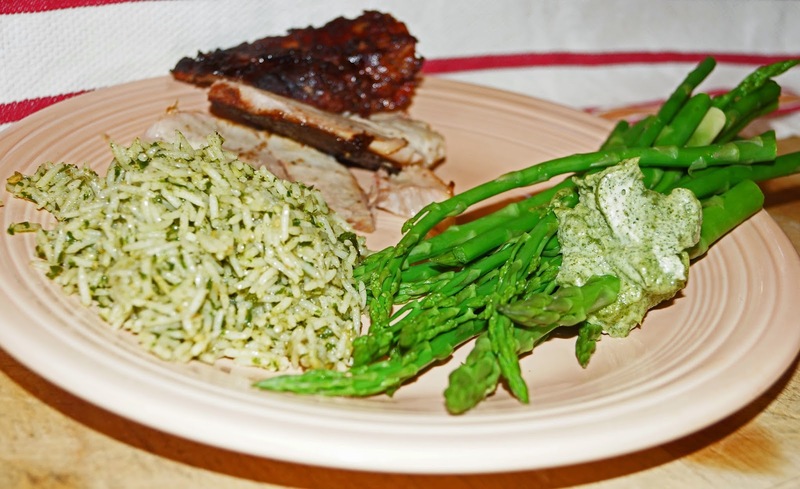 Once you have experienced Berkshire pork you may never buy supermarket offerings again. 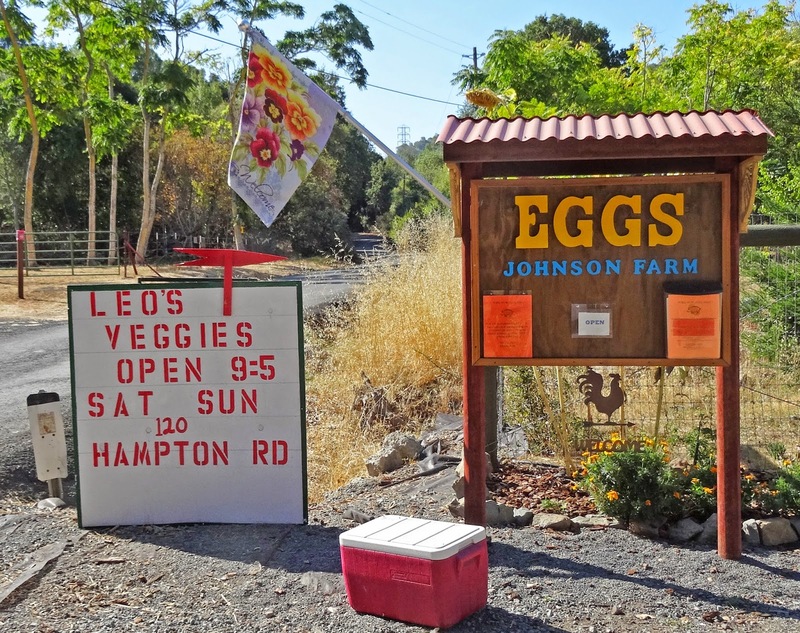 Johnson Farms sells eggs and honey at Leonardo's. They also sell Berkshire pork and in October Black Angus beef. I highly suggest you call first if you are interested in pork because the selection is limited. I am calling today. What a ride! This was a four event contest that just kept getting better. 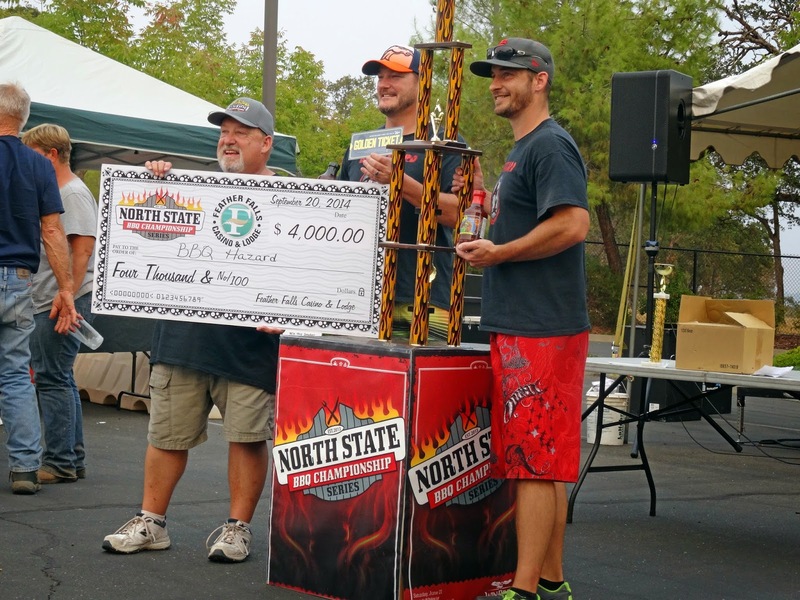 The North State BBQ Championship finals were held at the Feather Falls Casino yesterday. The weather could not of been nicer. 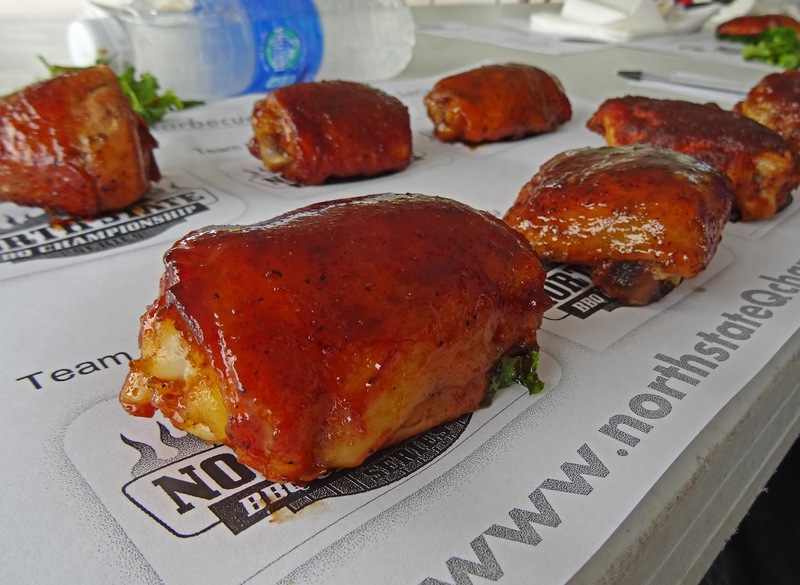 Mother nature shined down on thirty two barbeque competitors, bikers, judges, gamblers and the bbq hungry enthusiasts. We would like to share some images with you. 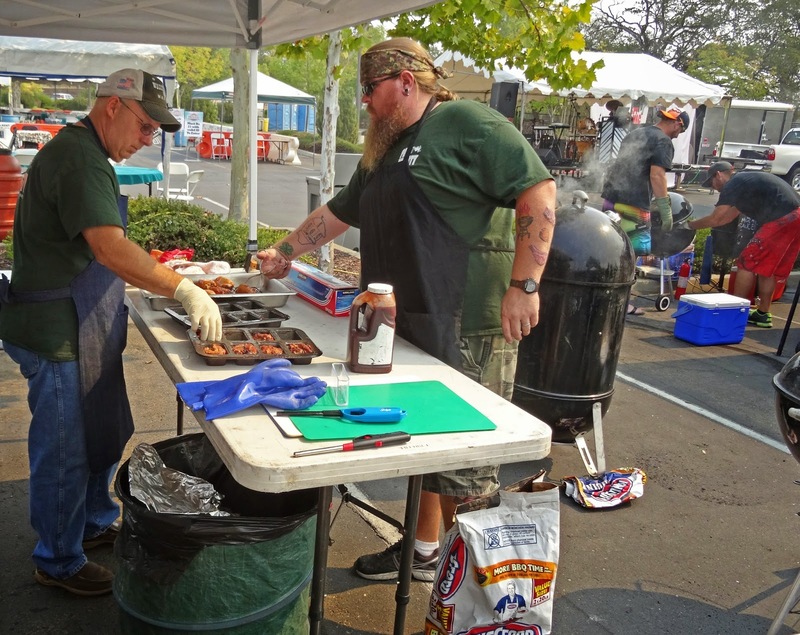 This was a three meat competition consisting of chicken, tri-tip and pork ribs. 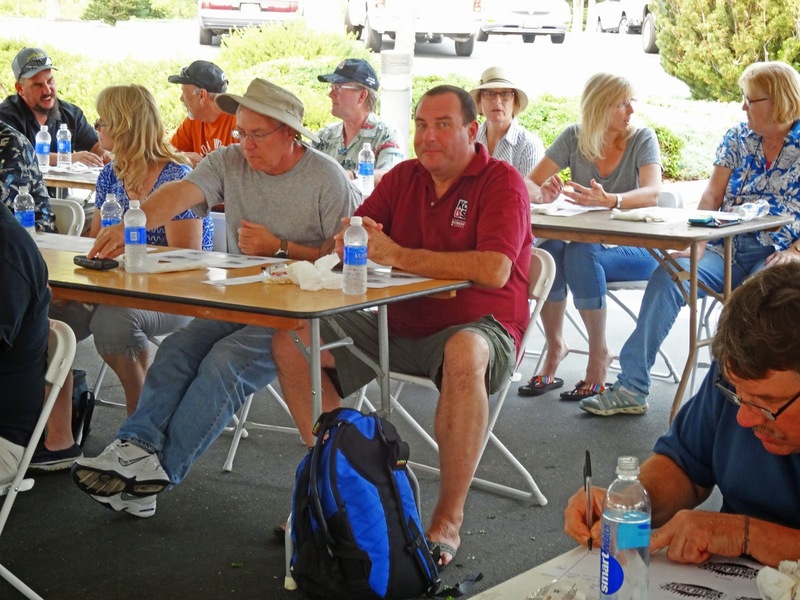 Thirty judges including Ms. Goofy and myself sampled and scored some of the best smoked meats in Northern California. It never stops amazing me the magic, meat, smoke, fire, seasoning and a whole lot of bbk knowledge can produce. 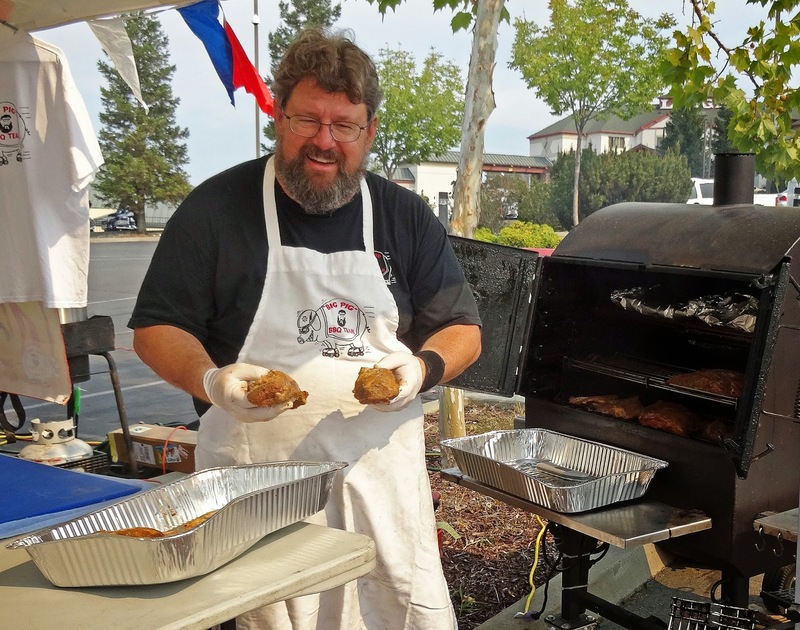 The public had a chance to purchase samples of the bbq offerings. 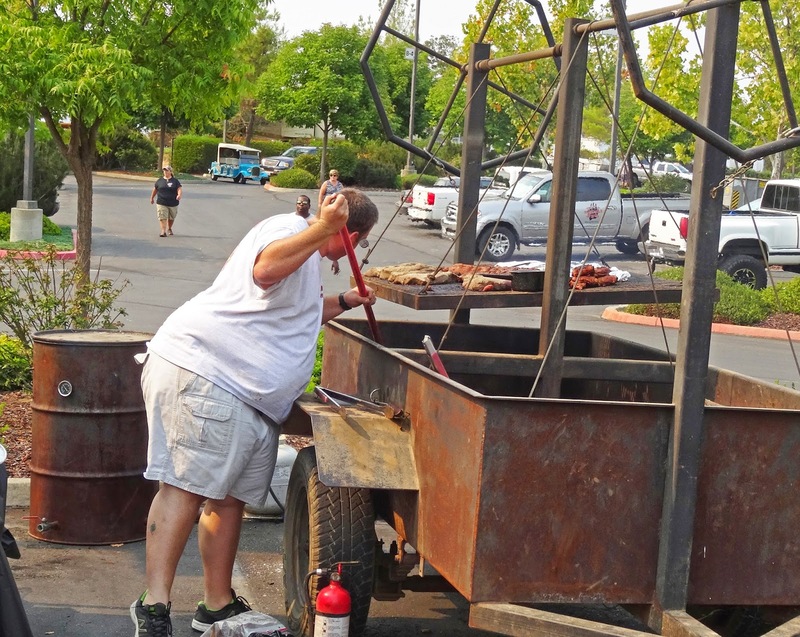 This bbq was so popular that it was sold out after several hours. Feather Falls Casino has a microbrewery on the premise. There was a beer garden conveniently located near the food and music stage. 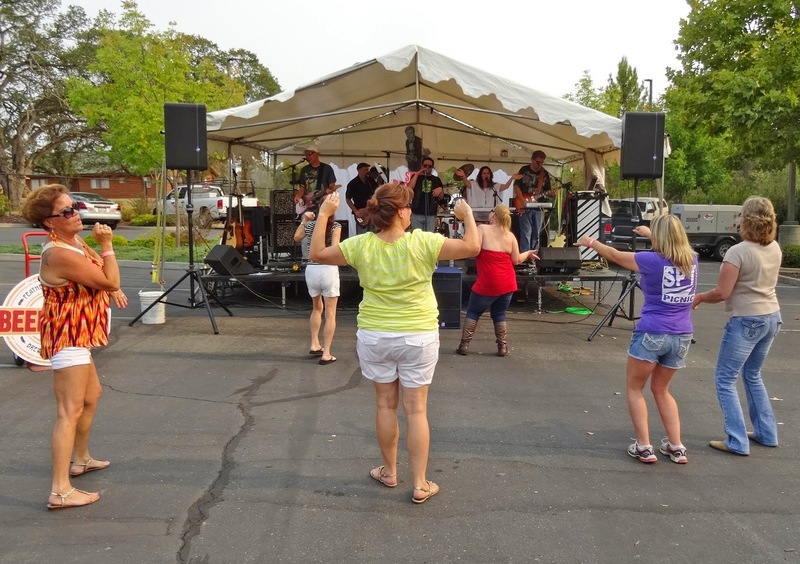 The band was very popular with the women participants evident by the makeshift dance floor. The men were safety enjoying the music in the beer tent area. 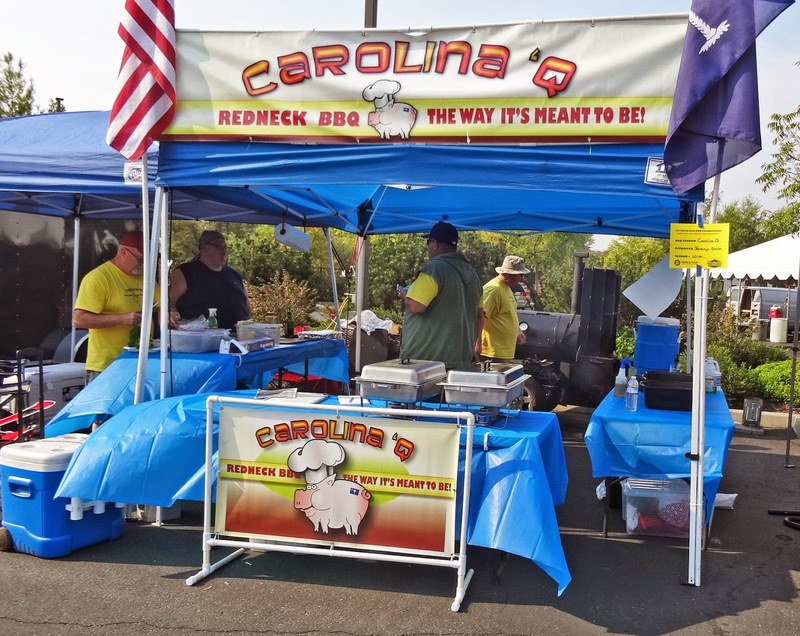 I want to mention a special appetizer that I enjoyed created by the competition team of 'Carolina Q'. 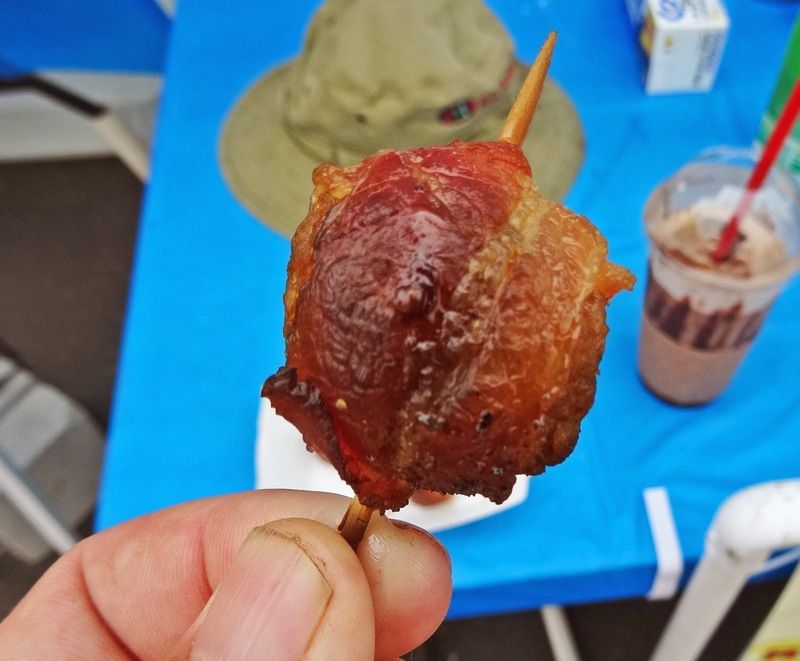 They had some bacon wrapped sausage that put a smile on this Mad Meat Genius face. This event also sponsored a motorcycle rally. 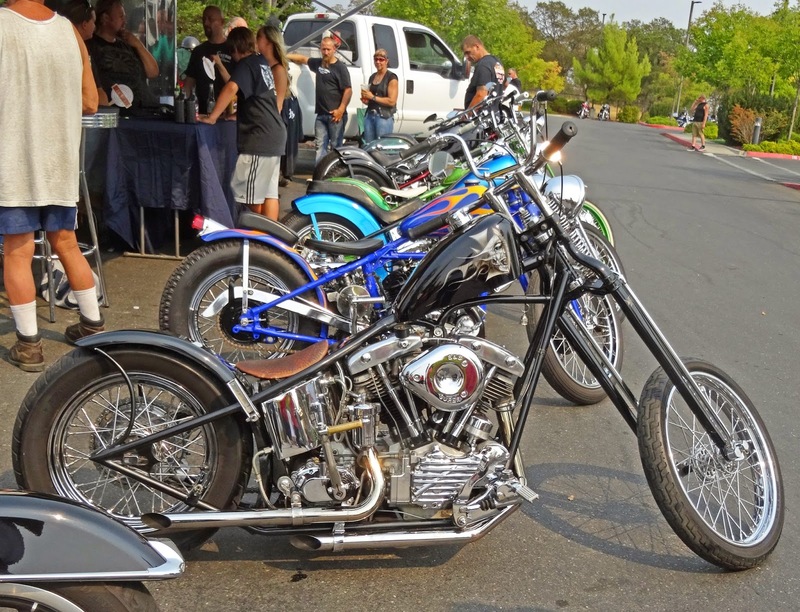 It was quit the scene of polished chrome and Harley attire. The scores were tabulated and the winners were crowned. 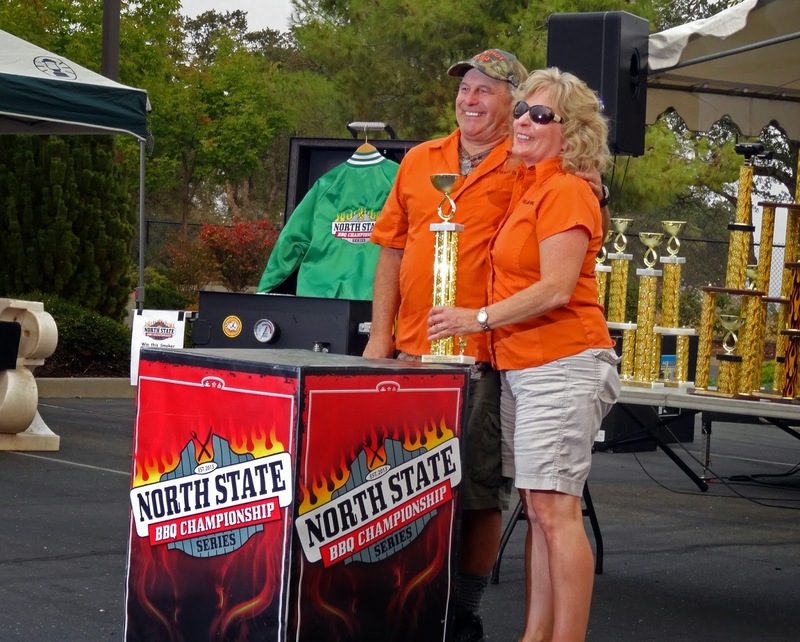 What fun it is to see our friends and extended bbq family take the walk to claim their trophies It takes a lot of time, grit and moxy to compete and we take our hats off to all the bbq teams. It was a little sad knowing this was the last contest of the series. What a fun journey. We cannot wait for the next competition. Thanks Scott Gomes for a great series. 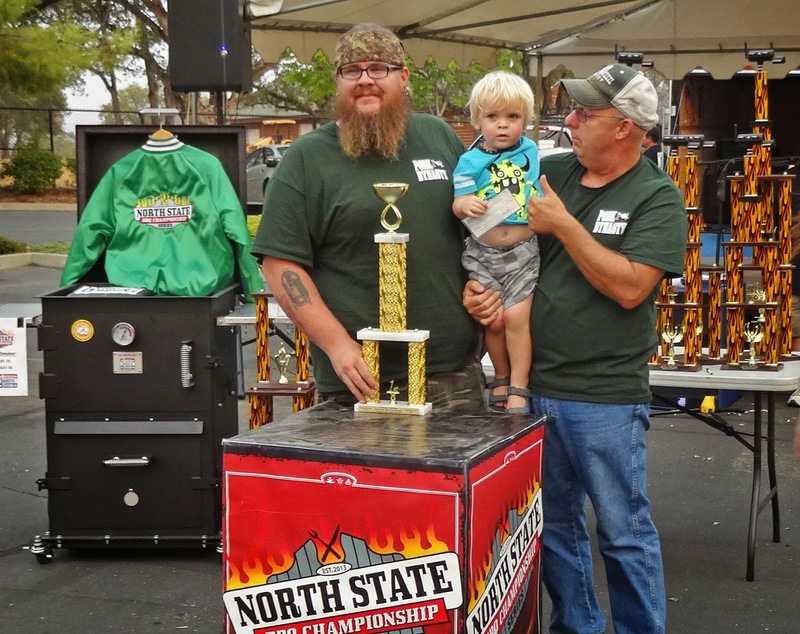 This is the final showdown in the North State BBQ Championship.. This is the third and final round to be held today at Feather Falls Casino. Ms. Goofy and I will be there with our polished judges badges. It promises to be a great time. See you there! 'That's Amazing!" would be Huell Howsers proclamation. We have discovered some true 'California's Gold'. We are talking about Leonardo's Produce stand. Leo's is located on a scenic country road near San Pablo Dam Reservoir.. It only takes minutes to leave the hustle and bustle of our city life to travel this beautiful country route. You may have to dodge the many cyclists because they have discovered this popular road. 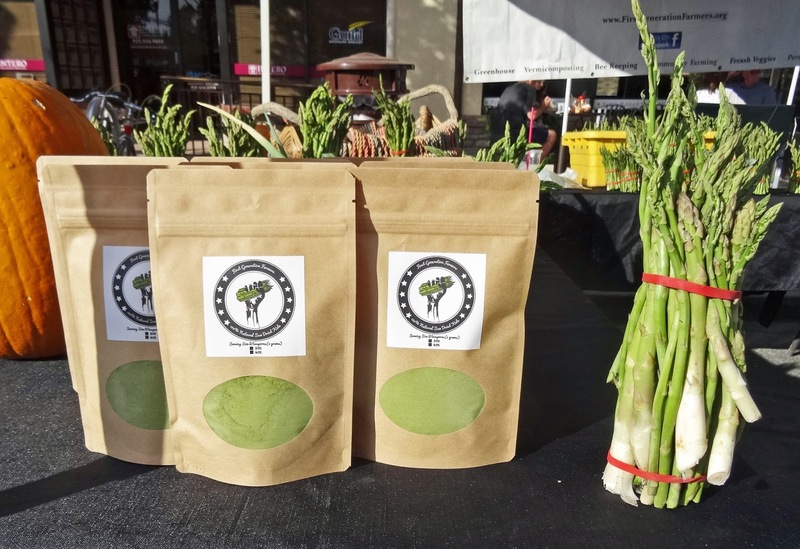 As some of you know we are farmers market junkies and I even manage a market several times a month. You would think we would have our fill with the many markets in the Bay Area. Leo's produce is a destination market that we love. 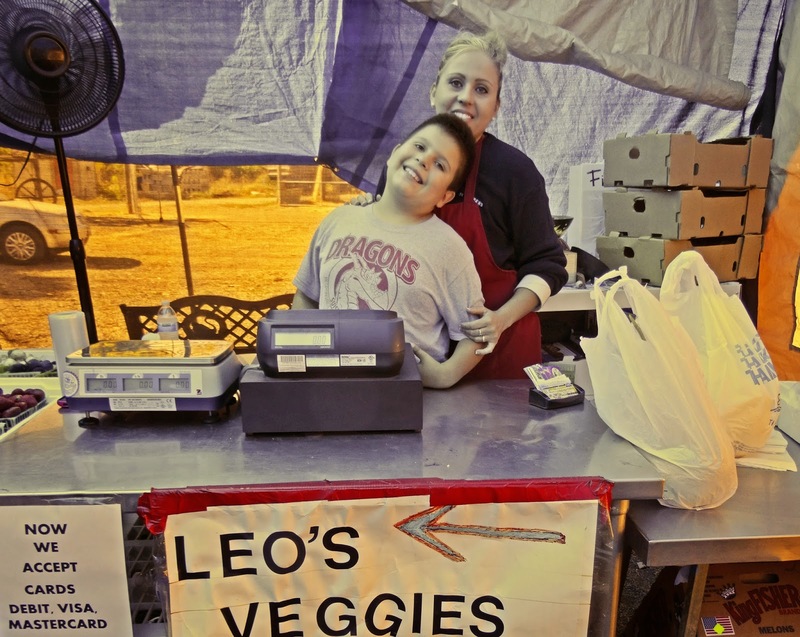 Leonardo's produce is a family run farm and stand. They are only open on the weekends. During the week Leo tends his crops to get ready for the weekend. You will meet his beautiful wife and energetic son. 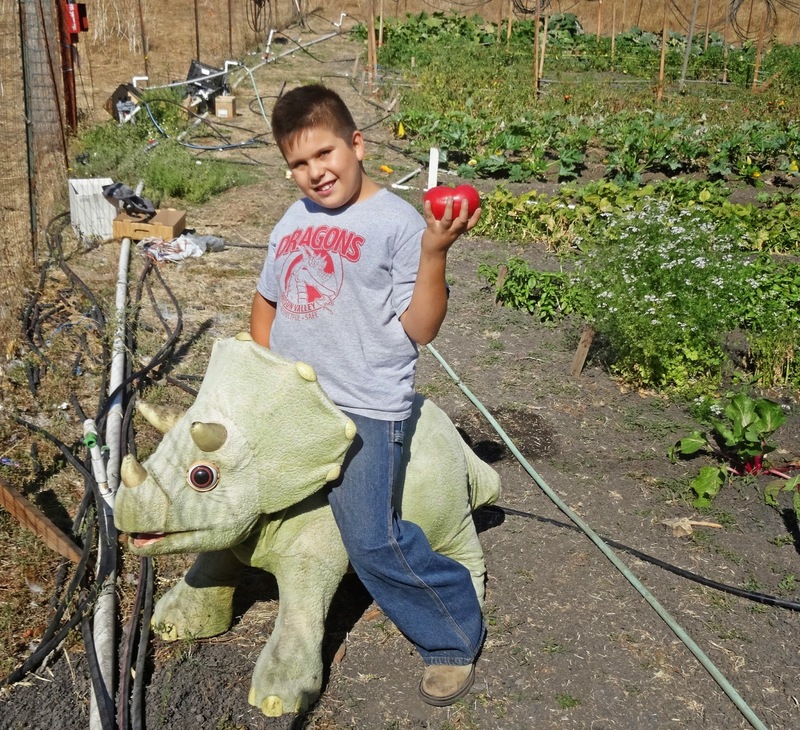 Leo's son will help you pick the perfectly ripe melon and freshest tomato's.. The produce does not get any fresher. In fact if it is not on the shelf you can walk a couple of steps and pick it yourself. 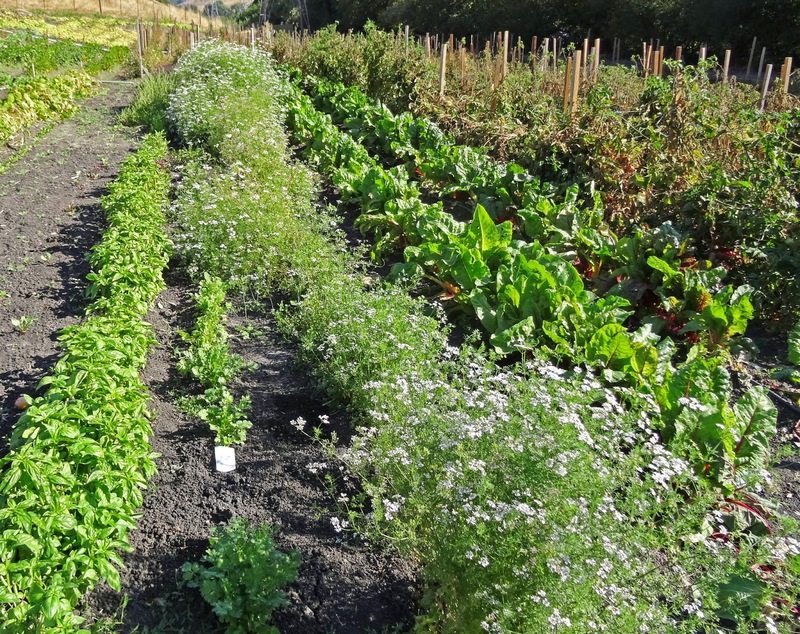 If Leo does not grow the vegetables or fruit he supplements his stock with produce form another local farm. The produce prices are more than reasonable. You can stock your pantry with fruits and vegetables for a song compared to downtown farmers markets. They not only sell produce but local honeys and olive oils. Johnson Farm is located next door with fresh Berkshire pork and eggs. (more on Johnson Farm later). Fresh bread and some of the best tasting fresh salsa is available. This is a one-stop shop. Leonardo's is a family run farm and stand that is a destination that we are proud to share with you. It is refreshing to find fresh produce at such reasonable prices. It does not get any closer to the farm than this. In the words of the late Huell Howser: This is California Gold." This is no ordinary weenny roast. This party has invited Western European and Moroccan flavors to this flavor fest. 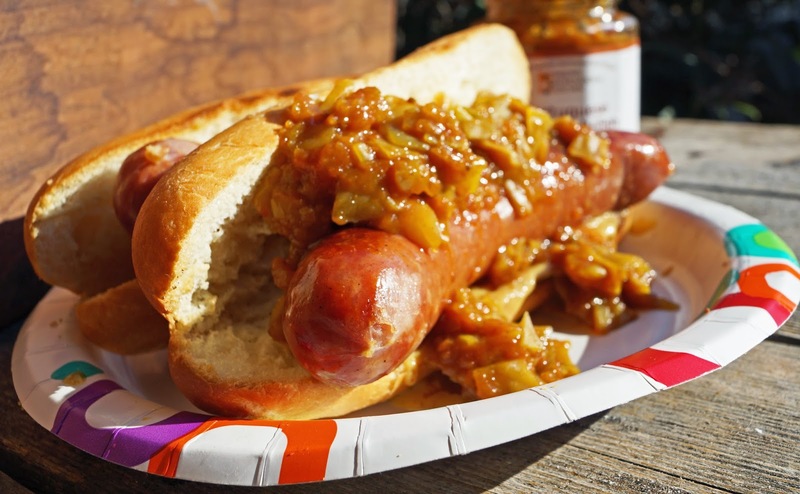 We review a relish from Baron's International Kitchen today. Have a gander if you will. The ‘greatwhite hunter’, a friend and frankly sometime a little bit eccentric, (The truth is he is like the creepy uncle that nobody likes to talk about) has recently cut his ties with the ‘Salt Mine’. We both have toiled and reaped financial gain from this large corporate machine. We also share the love of Meat Adventures. The ‘greatwhite hunter’ was in the Reno, Nevada area so I dispatched him to several meat emporiums. Wolf Pack Meats of the College of Agriculture Biotechnology and Natural Resources of University Nevada, Reno was one of his destinations. Wolf Pack meats sells grass-fed beef from their department at the college. The ‘greatwhite hunter’ came through on his Meat Adventure with several different cuts of steak. Today we are going to cook some rib-eyes. These steaks were cooked to a perfect medium rare. Even so there was a chew and tug with each and every bite. They did have a pleasant beef flavor. Here is the rub. They did not have that umami flavor associated with corn fed beef. 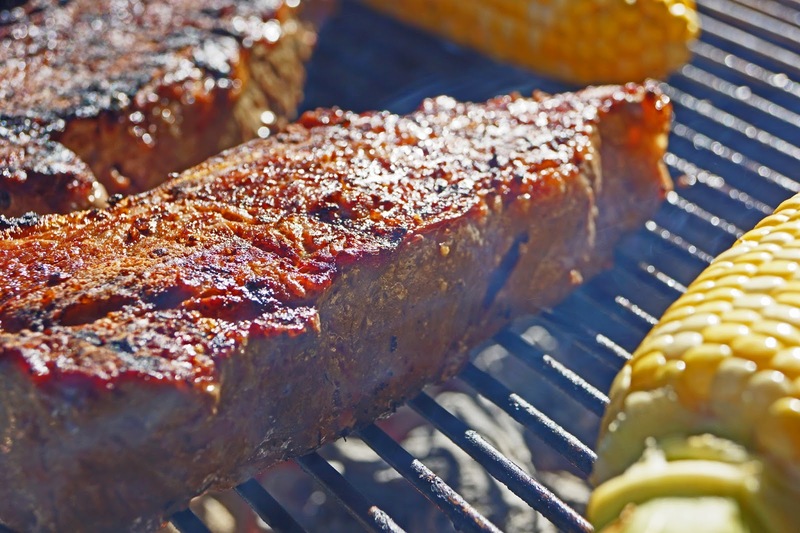 These steaks were just missing that special mouth feel and flavor that we crave. Now this is antidotal evidence and I am not entertaining a grass v corn-fed debate so let’s call it a day. We will let the Wolf-Pack run away. The Racing Honda is flying at warp speeds across the Bay Bridge to the Mission District in the City (San Francisco) for a special burrito lunch. 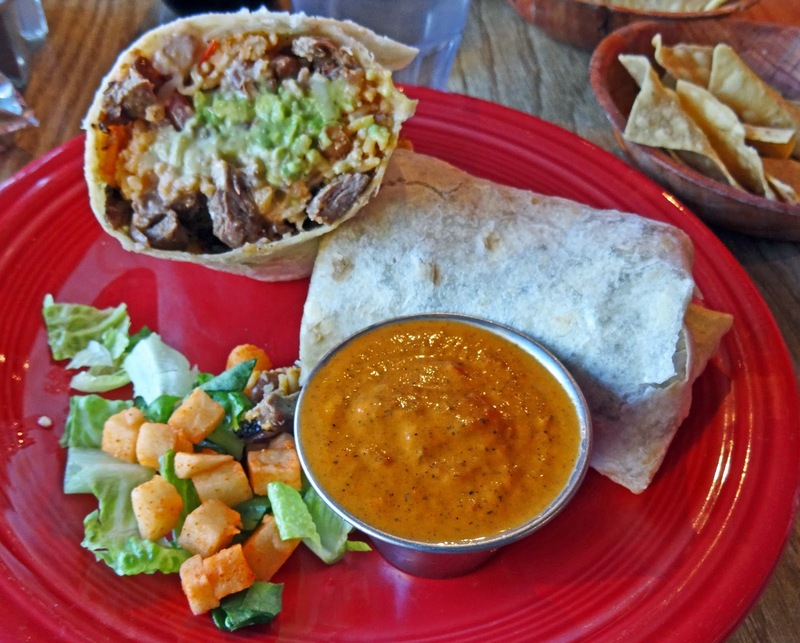 Papalote Mexican Grill is a tacqueria that has been featured on numerous television shows and makes the ‘Best of’ lists regularly. Papalote is the Spanish word for kite that coincides with the restaurants philosophy. They would like you to experience a family Sunday afternoon birthday picnic in Mexico City sharing food, fun and flying kites. I feel warm and fuzzy inside already. Papalotes also wants to promote a healthier more upscale type of ‘Mission’ style burrito. This is evident by a signature salsa, burritos served on real dinnerware and beans made with no-lard. Ms. Goofy is concerned because she loves; I mean really loves beans made with lard. Hold on to your arm rests because the Racing Honda slows for no burrito. Is it divine intervention or Karma? Whatever the reason we are on a parking roll provide by a legal non-metered spot one half a block away. 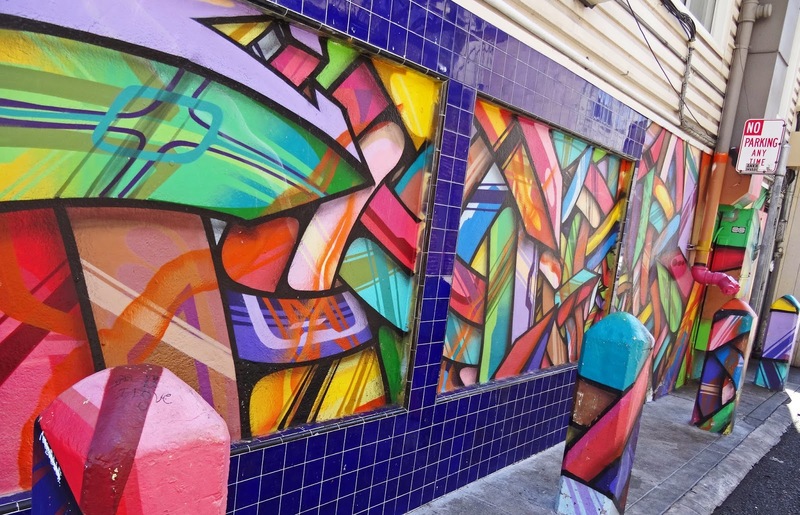 We are in the Mission district which is heavily decorated by murals. This colorful wall welcomed us to the entrance of Papalotes. Inside is a small dinning area with kites (papalotes) hanging from the rafters. You place your order at the counter to receive a small number marker to bring to your table. Immediately a server brings a small bowl of chips and a tiny (2 ounce?) 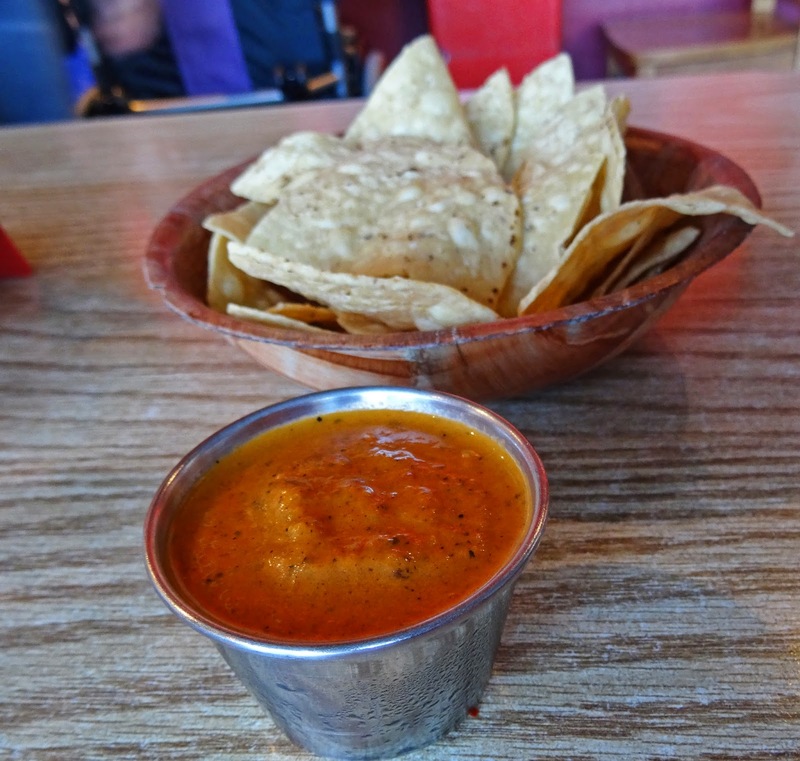 portion of their signature salsa. This salsa is very tasty. It is a mixture of roasted onions, tomato’s and peppers. 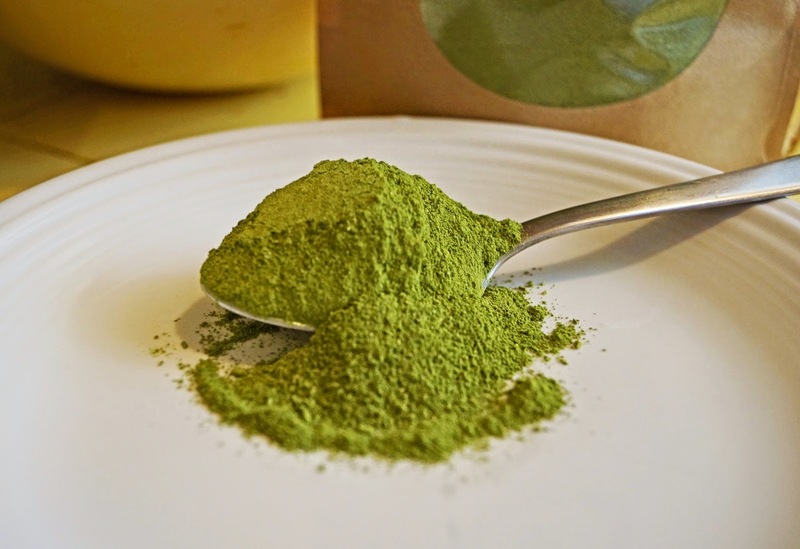 It is blended with some oil and spices. This salsa was very good. It was mild with great vegetable flavor. It was rich and creamy from the addition of blended oil. I ate the whole small serving with just a few tortillas chips. I had to have some more and would of liked some more heat. I went to the counter to inquire about a hotter sauce. They did have a hotter salsa but it was for sale only for 7 dollars. What? Okay, how about some more mild please? Papalote will charge you 50 cents more for a 2 ounce taste. Our burritos arrived on nice Fiestaware plates. Those of you that are familiar with ‘Mission’ style burritos know there is an art and procedure to eating a burrito without making a huge mess. Burritos are normally wrapped in aluminum foil. You peel the foil from one end and attack. The burrito is held upright to hold in all the burrito juices. As you proceed down the tube of meat love the foil is peeled back. At Papalote a knife and fork are provided. Ms. Goofy and I both ordered the carne asada. (Grilled steak). The steak was very flavorful and tender. The filling of rice, beans, signature sauce and meat formed a very satisfying lunch. I dosed my burrito with the little signature sauce that I had purchased. No knife and fork for this professional burrito eater. I picked it up with my meat paws and went to town. This rendering of ‘Mission’ style burrito was not very juicy with burrito love so it was not a messy operation. Papalote makes a wonderful signature sauce/salsa. The burritos were tasty and filling. I can understand why they are popular and generate so much publicity. They have stretched the boundaries of what a ‘Mission’ style burrito is. Plates, knives and forks are usually not provided for this type of food. Charging for extra salsa in my opinion is blasphemous. Sure the restaurant is in the business of making money and I would expect to pay for salsa to-go. But to require you to buy a bottle of a hotter style sauce seems wrong to this Chilehead. Even so this was a fun burrito adventure. We enjoyed our lunch. I do not think we will return because there are so many more ‘Mission’ style tacquerias to explore. I just wanted to share some of the best smoked prime rib I have had in a while. 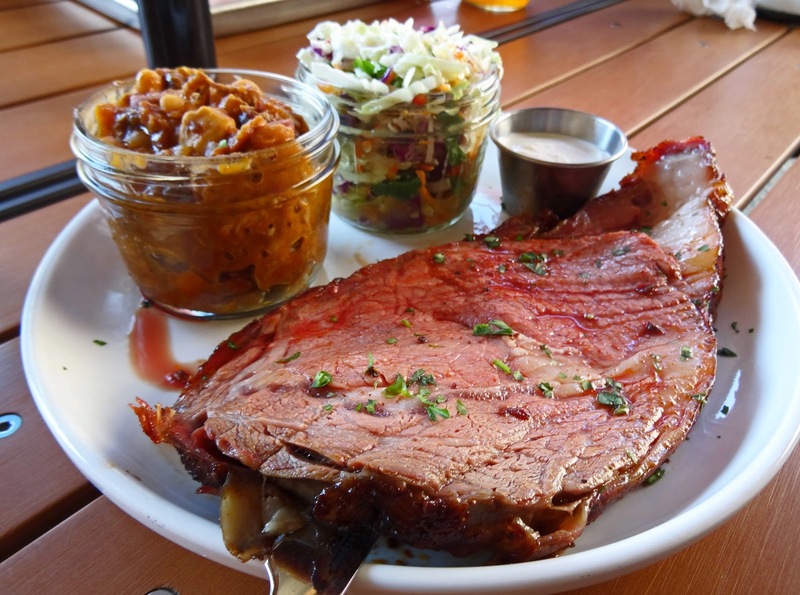 Two Friday's a month Beaver Creek Smokehouse in Martinez California serves smoked prime rib. Oh my was it good. 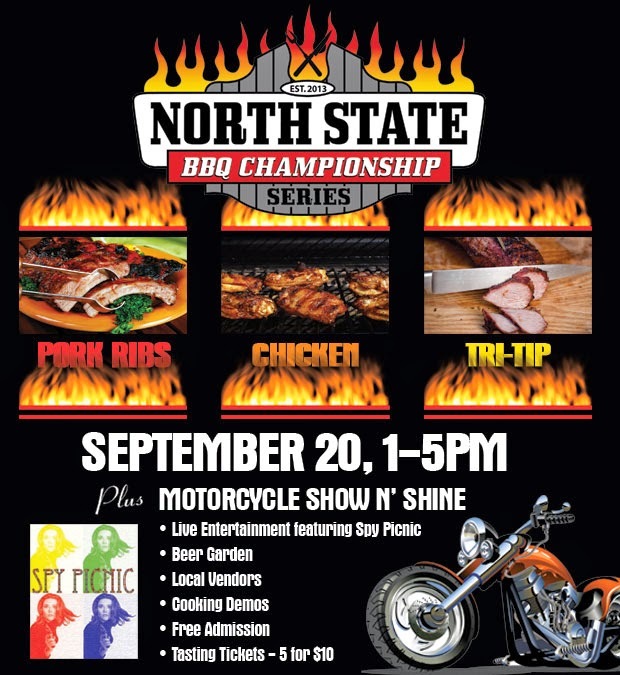 We are off to another bbq competition today. Smoke on the River in Sacramento.will be our destination. I hope we get to judge some more prime rib. 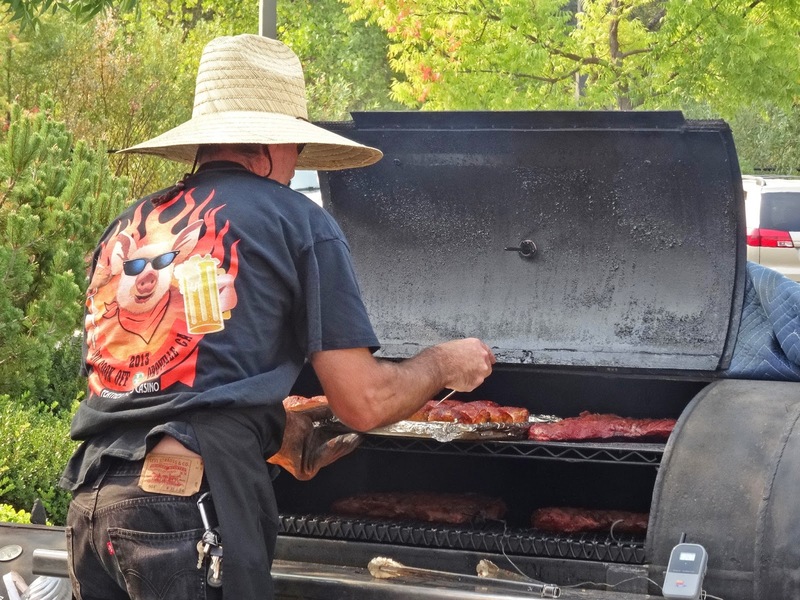 Having the proper tools are very important to achieve barbeque greatness. 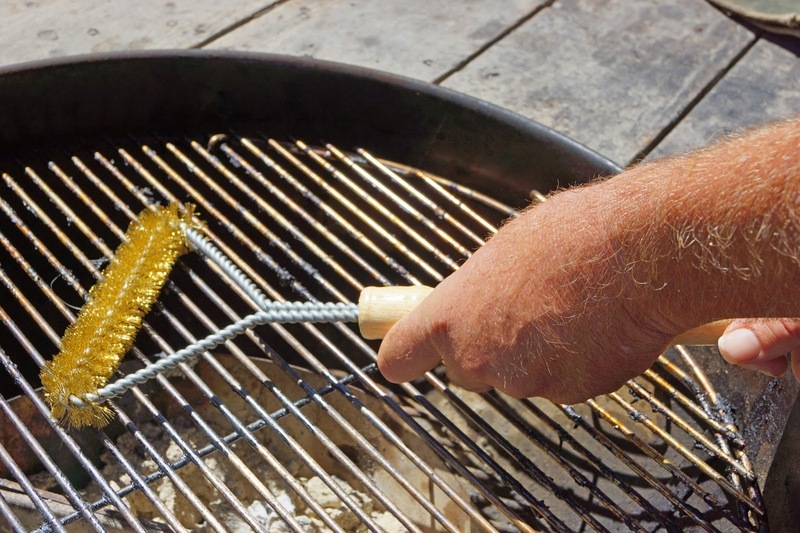 One tool we take for granted is the grill brush. Before and after every cook I faithfully oil and brush the barbeque grate. 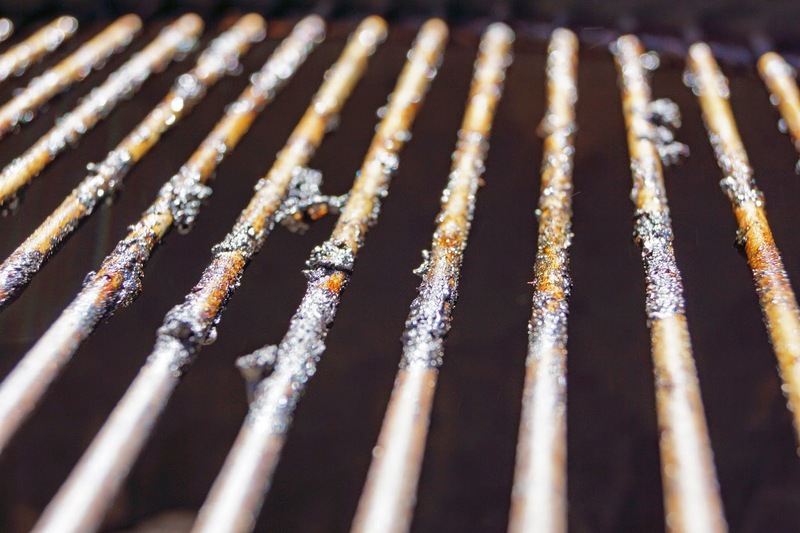 We have used numerous grill brushes with mixed results. Rizzi from Mr. Grill asked me to put their grill brush.through the paces. I accepted her offer and she immediately sent me a Mr. Grill brush for review. 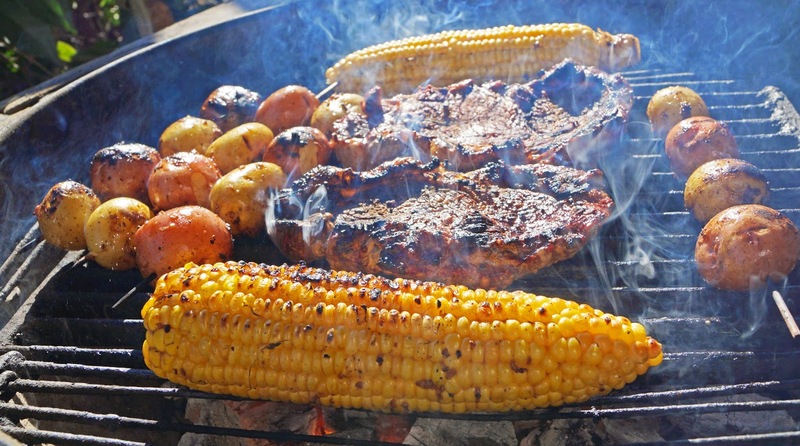 This will be the perfect excuse to fire up the grill. Like I need an excuse. Mr. Grill brush at first impression is a very quality made product. The handle is 18 inches long and made of sturdy oak. The bristles are made of shiny brass. Shiny now, but I hope to dull this brilliance with crud from the grill. The brass brush length is 6 inches long for maximum scraping area. This brush is sturdy and the bristles are the perfect size to get through the grates. This brush is even guaranteed for one full year. Let's give it a try. My routine before each and every cook is to give my grill a proper brushing. (and oiling). A charcoal fire is built and the grates are put in place. 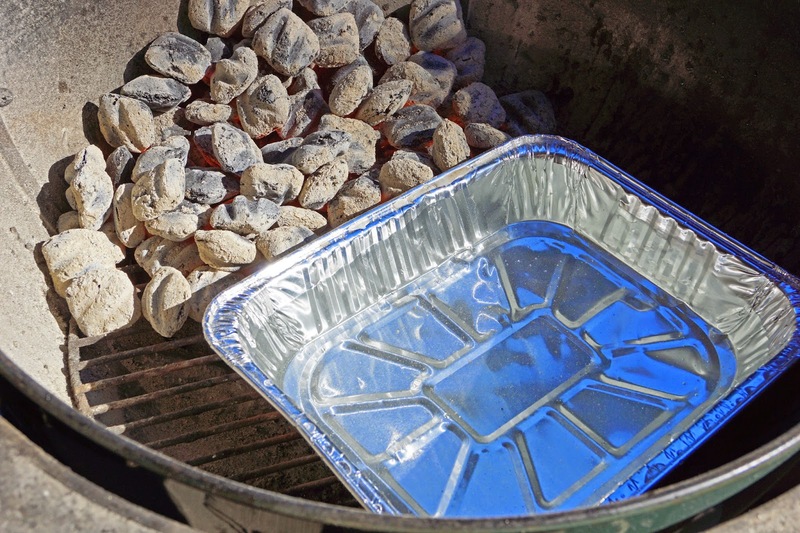 After several minutes the grates will be smoking hot. Mr. Grill brush glided easily over the grates to remove and destroy crud left from our last cook. We purposely left some crud from our last cook to demonstrate burnt on material by the image above. Mr. Grill made quick work to remove this unwanted grease and yuck. I personally like the long 18 inch handle. I could wrap both my large meat hands around the comfortable handle to provide extra leverage for those problem spots. The brass bristles had just the proper length to get between the grates for cleaning. Mr. 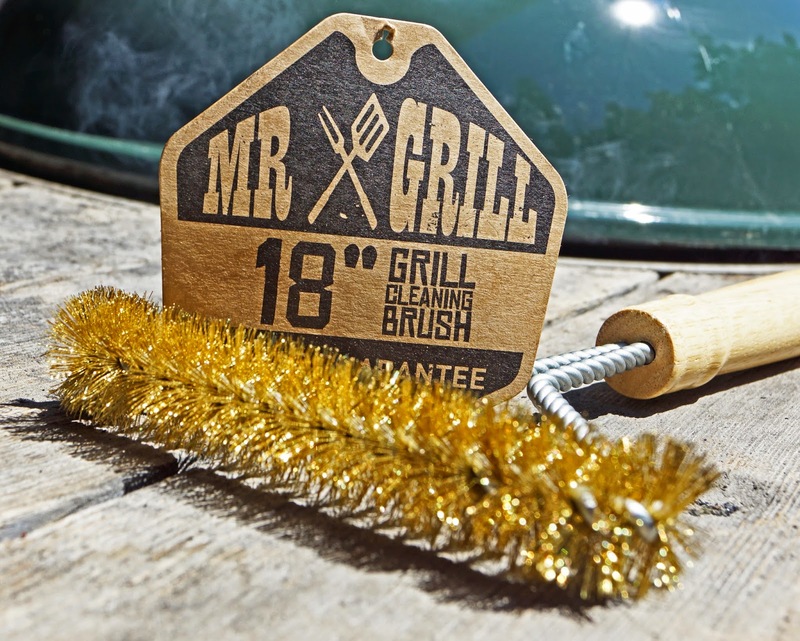 Grill brush easily passed with flying colors to be a quality grill brush. We proudly will add Mr. Grill brush to our arsenal of barbeque tools. With the proper usage of brushing (and oiling) the grill grates will almost guarantee success of non sticking and easy removal of your barbeque meals. 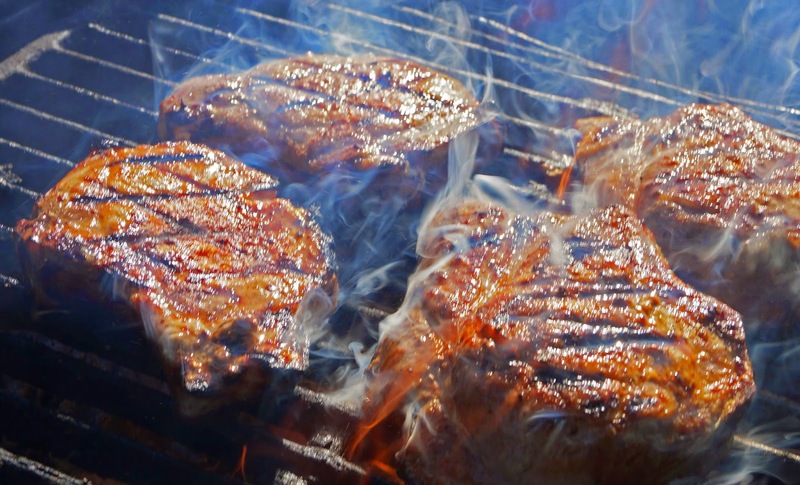 A clean grill will help achieve those beautiful grill marks. Mr. Grill will do the job. 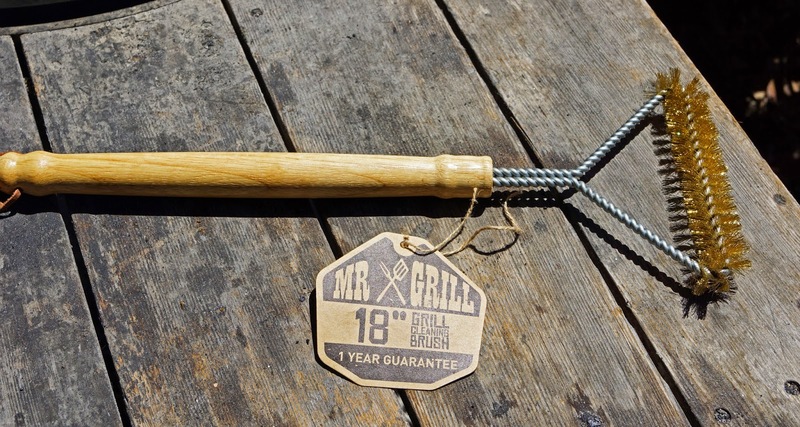 If you are interested in purchasing a quality grill brush you can find Mr. Grill on Amazon or you can order directly from Mr. Grill;s website.